Nicole and I get excited about seeing bookstores. It's been one of the constants of our cross country road trip. Prior to arriving in each new city, Nicole does oodles of internet research to make sure we don't skip anything fun. FOMO! New York Times Travel Section articles, blogs like the Culture Trip and Thrillist, and magazines like AFAR. My research is more basic. I pull up Trip Advisor's Top Things To Do and also google "[city name] best bookstores." (I also like to look at a local events calendar to see if anything fun is happening during our stay.) With respect to the city's bookstores, I then check out the store's websites that rise to the top of the Google results and also Yelp reviews. These usually give me solid insight into the book selling scene and provide enough information to confidently plan a bookstore visit. And the bookstore scene throughout the U.S. is thriving! For years, bookstores were dying out, chased away by online sellers. But no more. Small bookstores have been making a steady comeback. In my experience, this seems to be a survival of the fittest scenario. Although there may be less bookstores overall, those that have survived seem to be flourishing. What do Nicole and I look for in a bookstore? We have a few biases. First, we gravitate to smaller, independent stores rather than big box chains. Nicole and I have nothing against Barnes and Noble stores, but we are drawn to the curated selections of the independents. When the store doesn't have huge square footage, they are forced to make tough decisions about which books to stock. We get excited about seeing these decisions as we browse the shelves. 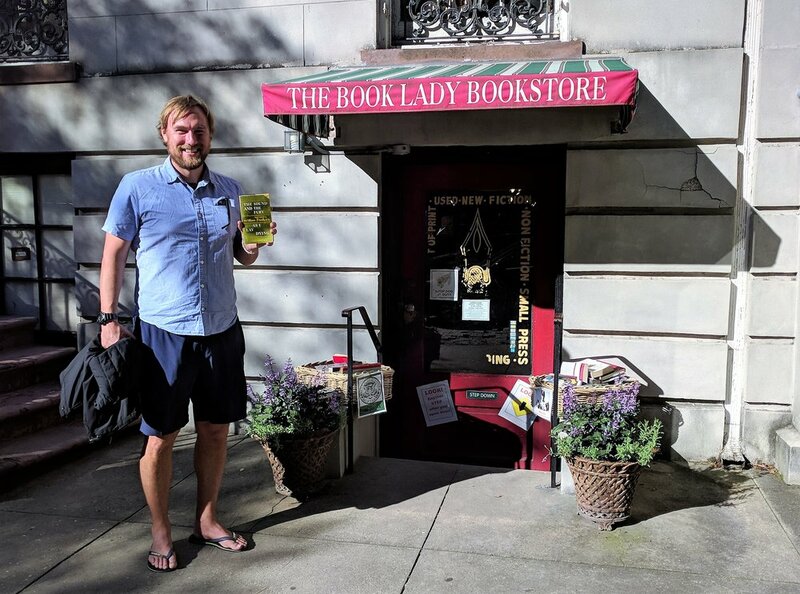 The BookMark near Jacksonville, Florida is a great example of a tiny store we recently visited where Nicole couldn't believe all of the interesting reads she found that she wanted to walk out the door with. Second, I strongly favor stores selling a combination of new and used books. Auntie's Bookstore in Spokane, Washington, The Book Lady in Savannah, Georgia, and The Strand in New York City are great examples where new and used books sit side by side on the shelves. When stores sell exclusively used titles, I miss being able to browse the new releases to see what's current. At the same time, I'm incredibly cheap and get excited about finding a good deal on a used book. The 1946 paperback edition of The Sound and the Fury by William Faulkner that I recently picked up at The Book Lady for $3.50 is a great example (I also enjoyed seeing that the cover price was $0.95 -- an appreciating asset I told Nicole!). Finally, we enjoy seeing the funky, non-conformity of many of the independent bookstores. 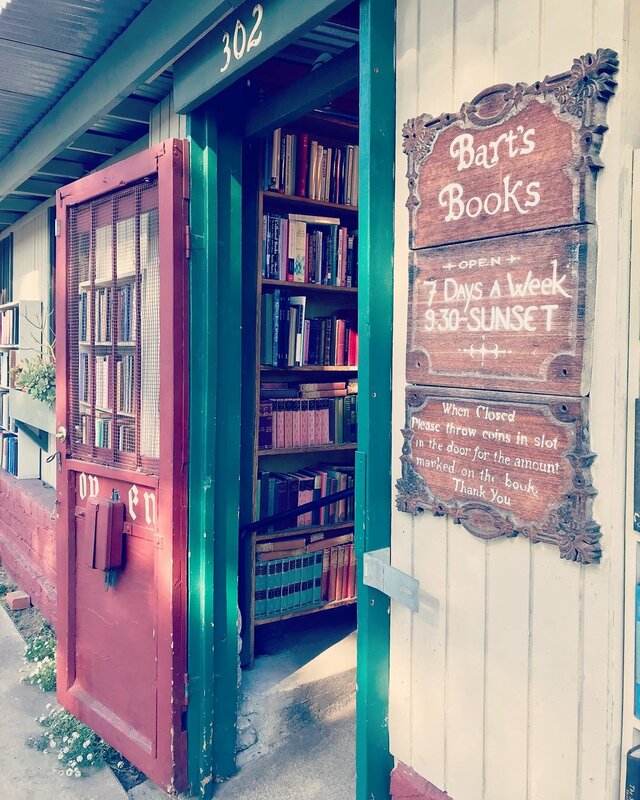 Bart's Books in Ojai, California, an outdoor store where the bookshelves form the walls is one such example. Along these lines, we also love a good bookstore cat roaming around. And lot's of staff review cards alongside the books (like they do at Edmonds Bookshop in Edmonds, Washington). The truth is, for many of the stops on our cross country road trip, Nicole and I often struggle to find things we are excited to do. Eating out and trying new restaurants is fun, but quickly gets expensive. And we are fairly picky when it comes to the landmarks and historical sites we want to see. Bookstores provide something local, fun and educational to check out. They also inspire our reading lives as we search for the next great book to read. See you among the stacks! Like this post? Want to read more about Travis and Nicole's travel adventures? Check out The Anatomy Of A Road Trip: Observations, Tips, And Tricks From The Road -- Part 1.